Panelists at the public forum spoke about the divide between community and police across the United States and what is being done in Cherry Hill to build a stronger police-community relationship. Cherry Hill Police Chief William Monaghan answers a questions during the Cherry Hill Community and Police Relations Forum last Tuesday at the Unitarian Universalist Church in Cherry Hill. Joining him were fellow panelists Camden County Freeholder Jonathan Young, Cherry Hill African-American Civic Association Vice President Bill McCargo and Gloucester County Equal Employment Opportunity Commission Director Milton Hinton. The audience gathered at the Unitarian Universalist Church in Cherry Hill last Tuesday for a public forum entitled “Cherry Hill Community and Police Relations” was a very diverse group. Community members of different races, religions and from a variety of community groups came together for a detailed conversation on the state of police and community in the United States and how the police’s relationship with the community is handled in Cherry Hill. Though the participating panelists agree there was a lot of positive conversation on Tuesday evening, they also felt the conversation was only beginning. 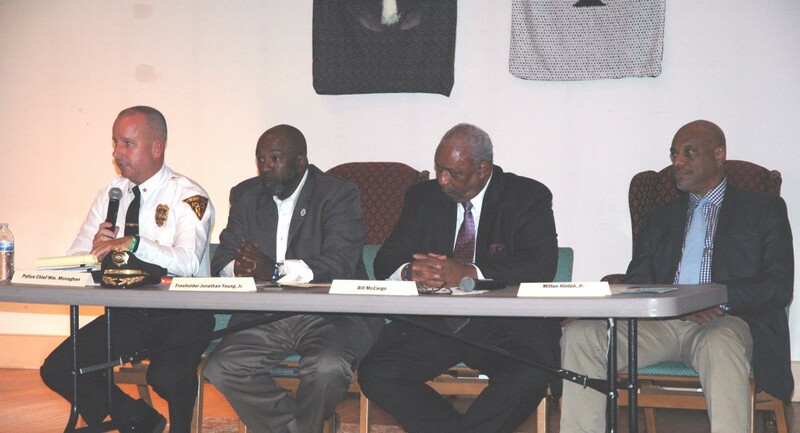 The panel for Tuesday’s forum included Police Chief William Monaghan, Cherry Hill African-American Civic Association Vice President Bill McCargo, Camden County Freeholder Jonathan Young and Gloucester County Equal Employment Opportunity Commission Director Milton Hinton. Also in attendance at the forum were a large number of Cherry Hill police officers. Monaghan said nearly all of the officers came to the forum on their own time to hear questions and thoughts from members of the community on police relations in the township and elsewhere. “They volunteered to come out and listen and to understand,” Monaghan said. The focus of the forum was on how police handle encounters with civilians, particularly minority civilians. A rash of police shootings across the United States have led to numerous protests and division among Americans. Some panelists felt this division was the biggest problem with police-community relations in the country. McCargo said the Cherry Hill African-American Civic Association uses communication as a tool to fix issues in the township. He spoke of how CHAACA arranges meetings with the school district, police department and township when it believes there’s an issue and is able to come to positive solutions in a peaceful manner. There was a lengthy discussion on what police departments across the country can do to improve relations with civilians and how the Cherry Hill Police Department does things differently. Hinton, a former police officer in Virginia, felt a big issue in some police departments was officers lacking training in understanding communication, cultures and molding interpersonal relationships with the communities they serve. Hinton said more non-police educators should be brought in to help officers with these skills. In Cherry Hill, Monaghan said the police department requires every officer to have a bachelor’s degree and many officers have advanced degrees. Monaghan felt having officers attend college with civilians helps them understand people from outside their own social circle. Racial bias was another major topic at the forum. Monaghan described how Cherry Hill Police takes bias very seriously. He spoke of how it is important for police departments to hire officers with strong character traits. The Cherry Hill Police Department released data on its motor vehicle stops since 2014 and broke down traffic stops by race. The number of minority civilians Cherry Hill officers stopped over the past couple of years lines up with 2015 Camden County Census data. In the first six months of 2016, 56 percent of civilians pulled over were white and 21 percent were black. This lines up closely with the 57.8 percent white population and 21.2 percent black population in the county. Monaghan said the police department keeps track of the data to make sure officers are following policies and are not displaying bias. The importance of community policing was also emphasized. Freeholder Jonathan Young said the Camden County Police Department has put a particular emphasis on community policing in Camden City. The department is trying to attack crime in the city through building a relationship of trust between the residents and officers. “The best part about it is it’s giving a relationship to the younger generation of how to interact with police officers, how to be able to trust that police officer,” Young said. Monaghan spoke of how important community policing is in Cherry Hill. He spoke of how officers frequently appear at community events and take the time to speak to residents in their line of work to establish a bond. This was apparent before and after the forum, as those in attendance spoke to many of the officers. The police department also handed out love bracelets to those who visited the forum as a statement to unite all members of the community. The biggest goal for members of the church and the panelists is to continue the informative conversation from Tuesday’s forum in other communities. The Unitarian Universalist Church plans to share the conversations from the forum with other Unitarian churches in New Jersey, and the panelists expressed hope other towns across the country begin to have conversations on police and community relations. “I just hope what’s transpired here is what transpires across the country,” Hinton said. “It’s only when we all come together that we can make a difference,” McCargo said.